Note to readers: All of the trademark bombast and hyperbole were in place when Bill O’Reilly wrote his very first book in 1998. This one was a serial killer novel titled Those Who Trespass. And O’Reilly claimed to know where every last body was buried during his stop in Dallas to promote it. He’s since gone on to pen a long string of bestsellers, all of them in the non-fiction arena. Here’s how it all began for the recently ousted Fox News Channel personality. This article was first published on July 2, 1998. Bill O’Reilly knows where the bodies are buried. This helps when your first novel’s protagonist is a vengeful TV journalist turned serial killer. “Everything in the book, except for the actual crimes, is true,” he says during a recent stop in Dallas to promote Those Who Trespass. O’Reily, host of the Fox News Channel’s week-night The O’Reilly Factor, says television news is by and large a shark-infested cesspool. He’s been taking notes since the late 1970s, when he was a guppy in the Dallas-based WFAA-TV (Channel 8) newsroom. 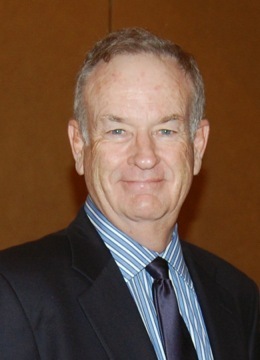 They “piled up to the ceiling in my cellar” during O’Reilly’s careening career through ABC, CBS and the syndicated Inside Edition, which he anchored for six-and-a-half-years until March 1995. He then had six months to kill before beginning class at Harvard University’s Kennedy School of Government. Dear diary, seize the time. His resultant “novel of television and murder” is a swift, entertaining 288-page read without literary pretensions or genuflections. It’s O’Reilly’s way of sparing readers the boring details. To be or not to be . . . ah, shaddup. By Page 7, womanizing White House correspondent Ron Costello already is breathing his last after being assaulted in a hotel room by a former colleague. Costello exits with a silver spoon in his mouth -- and through his brain stem. It’s a giant step beyond staring daggers. Not that he’s Jonathan Livingston Seagull. O’Reilly admittedly has burned bridges, copped attitudes and taken his turns in the muck. Without cable, he might not have much of a job anymore. But on the fledgling Fox News Channel, his abrasive O’Reilly Factor is aftershave on a razor cut, iodine on an open wound. It works for him in times when too many interviewers come off as graduates of Namby Pamby U. That’s why O’Reilly says he told potential guest Tom Selleck to “take a walk” when he supposedly wanted to keep some subjects off limits. “I’m not gonna sell myself out to try to get guests to come in,” he says. “That’s what’s corrupted the television news business. I don’t want to be friends with these people, all right? I’m not in the club, and they don’t want me in the club. They’d let me cut the front lawn, but they won’t invite me in for lunch. Fine. So there. O’Reilly, who dubs his show “Nightline with an attitude,” says he’ll continue to ask the questions Larry King won’t. He also tells viewers what he thinks, while Fox slaps an “Opinion” disclaimer on home screens. He’s also writing a second book, this one on the world of tabloid TV. His years at Inside Edition served to prime the sump pump.